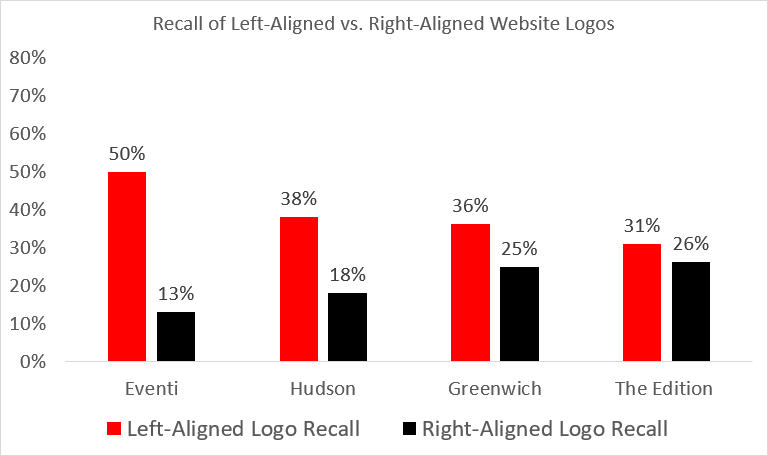 Summary: Users are 89% more likely to remember logos shown in the traditional top-left position than logos placed on the right. A left-aligned logo is comfortable for users, but because it’s such a longstanding tradition, this standard is a tempting target to anyone wanting to appear unconventional. Violating this convention seems like an easy way of immediately distinguishing a design from its competitors, and standing out from the crowd. For example, the website homepage shown below for the New York Edition hotel mirrors the traditional layout and displays both the hotel name and the navigation menu on the right edge of the page. The website for the New York Edition hotel breaks web conventions by placing the site logo and navigation on the right edge of the page. Clearly it’s possible to disregard the standard for top-left logo placement and still end up with a reasonable website. If you were to show users the website above and ask them what the name of the hotel is, they’d be able to figure it out. It’s easy to see how a designer might decide that conforming to traditional web guidelines is less important than creating a unique brand experience by using an unusual layout. But before committing to this course of action, you should make sure you know exactly what you’re giving up. Users looked at each website for about a minute, and rated their perception of whether the hotel was welcoming, unique, stylish, and somewhere they would like to stay. Users saw 5 different websites (in a randomized order), and subsequently answered some unrelated demographic questions (to minimize the recency effects that may have improved their memory of the last seen site). In total, 128 users participated in the study, which we ran with UserZoom (one of our preferred remote user-testingservices). As you’ll see below, placement definitely does matter, at least if you want users to actually remember your brand. People were significantly more likely to remember the name of a hotel when the logo had been positioned in the top left corner of a website, compared to in the top right corner. The comparison of left vs. right logo placement used images like the ones shown below: the real website for the Hudson hotel on the left, with its left-aligned logo, and our manipulated version on the right, with the logo and navigation flipped to the less conventional right-side placement. We compared the real Hudson hotel website (on the left) with our manipulated version (on the right). The average lift in brand recall was thus 89% by having the logo on the left instead of the right. This is one of the biggest differences we have seen in user-experience metrics from such a small layout change. Users were significantly more likely to recall the hotel name when it was presented on the top left, compared to logos presented in the top-right corner. Do Unusual Logo Positions Make a Brand Seem ‘Unique’? Aside from the memorability, what about the less tangible effects? Did users perceive websites with nontraditional placements to be more unique or stylish? In a word, no. There were no statistically significant differences (according to a two-sample t-test) in how people rated the hotels with traditional left-aligned logos, compared to the ‘unconventional’ right-aligned logos. In fact, in most cases, the left-aligned logos were rated slightly more ‘unique’ and ‘stylish’ (though again, these differences were not significant.) 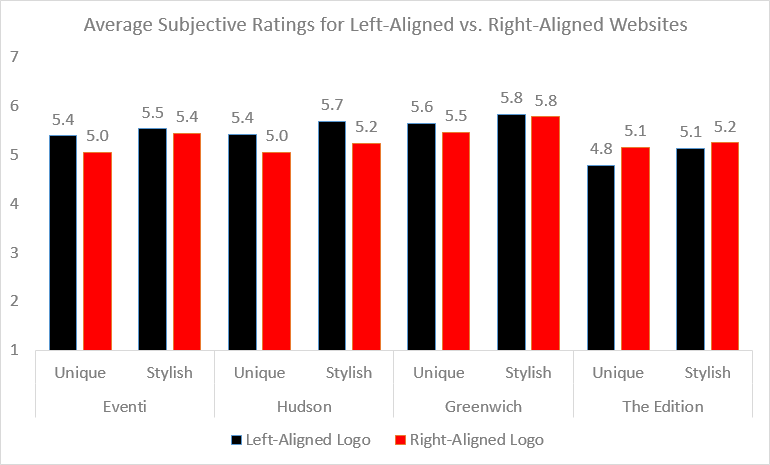 There were also no statistically significant differences between left-align logo design and right-aligned logo designs in the two other dimensions that users rated: whether the hotel seemed ‘welcoming’ and whether they would like to stay at the hotel. People did not rate designs with right-aligned logos as more stylish or unique than the left-aligned versions of the same website. Branding and visual design involve complex interactions of perception and user expectations, and seemingly minor details can have a big unintended effect. For example, when preparing the designs for this study, we noticed that hotel names written in difficult-to-decipher script were much less likely to be remembered at all, regardless of their position. There is no formula that can tell you exactly what your website should look like. But it’s clear from this research that you can’t rely on shortcuts like disregarding standard web conventions to make your site look special. People are attracted to novelty, but we’re also creatures of habit who rely on patterns to make sense of the world. When you break these patterns, you risk losing people’s attention altogether.